Wait. Is that right? How can there be LIQUID polymer clay? Isn’t that an oxymoron like “jumbo shrimp? Well, I think that causes a lot of confusion about what, exactly, liquid polymer clay is and how it can be used. Liquid clay is just what the name says, it’s a liquid version of polymer clay. There are three major brands of liquid polymer clay (Sculpey, Kato, and Fimo). Soon Sculpey will have a new member of the liquid clay family, Sculpey Clear (Transparent). I sat down with these common brands and put them through their paces. Here’s what I found when I compared these four liquid polymer clay varieties. Polymer clay itself (the putty/dough/clay) that we know and love, is made from polyvinyl chloride (PVC) particles suspended in a plasticizer. To turn it into a dough, binders and fillers are added. Liquid polymer clay has the same basic ingredients as the dough, but it lacks the binders and fillers. So it’s runny like a liquid and comes in a squeeze bottle. But just like our beloved polymer clay putty, curing with heat causes the particles of PVC to fuse, locking with the plasticizer to form a solid, yet flexible, mass. In this article, I compare Translucent Liquid Sculpey (TLS), Liquid Kato, Liquid Fimo, and Sculpey Clear. The new Sculpey Clear will be in stores in April 2017 and the advance sample I received did not yet have a label! While the baking temperature on the bottle’s label is as low as 265°F (130°C), I found that you will get a much clearer result when you bake at 300°F (150°C), regardless of brand. In addition to that, you can use a heat gun to further clarify thin coats. See examples below. The above samples were drops poured into a fairly thin puddle on a piece of glass. What would happen if liquid polymer clay were baked in a container, such as a glass vial or perhaps in a mold? Would it be clear like resin? Liquid polymer clay in glass vials, before baking. Liquid polymer clay in glass vials after baking a 300°F (150°C) for 45 minutes. As you can see, liquid polymer clay, when poured thick, can be quite opaque and can even discolor. Note the profusion of bubbles in the Liquid Fimo. The liquid Kato discolored the most, even though its label directions do say to bake at the temperature I used. So…thin coatings work best when you’re trying to get a clear result. What happens if you use liquid clay in a bezel, as a substitute for resin? Well, you know I had to check that out, too. Here you’ll see what happens when liquid polymer clay is used to fill a bezel, then baked. Note how clear Sculpey Clear is in this situation and how TLS is not very clear. **Note** For these samples, liquid clay was poured over raw cane slices, then baked together. The Liquid Kato did not make all those bubbles when it was used as a coating over baked clay. In fact, it worked beautifully. Also note the slight color change the coatings added. Interesting, isn’t it? Well, let’s read on to learn more about the individual brands of liquid polymer clay. As you might suspect, each brand has slightly different working characteristics and therefore has different optimal uses when it comes to making a clear coating. To clarify liquid polymer clay, it’s helpful to use a heat gun. What kind? You can get okay results with an embossing heat gun from a craft store. But I find that it doesn’t get hot enough. I use a heat gun from the hardware store, the kind that’s used on heat-shrink tubing and to strip paint. It’s helpful to have both variable speed fan and variable heat settings for maximum versatility. Unfortunately, though, a hair dryer will not be hot enough. Translucent Liquid Sculpey is the first liquid clay that I remember being on the market and it’s often referred to by its initials, TLS. The label has changed over the years, but the formula appears to be the same. TLS appears white, has the consistency of white glue, and is fairly grainy when you rub it between your fingers. It has a mild smell similar to that of Premo. After baking, TLS has a slightly milky appearance and is not completely translucent. It can often have lots of tiny bubbles, but that seems to diminish in thin coats or when warmed very slowly. Because of this, it’s best used in applications where clarity does not matter. It can be used as a coating, but results are best when used quite thinly. TLS is matte after baking so it makes a wonderful matte protective coating for surface treatments. Just sponge on with a cosmetic sponge and bake. While TLS is matte when oven baked, but it will take on a slight shine, sort of like a satin, when a heat gun is used on it. Note the slightly grainy and perfectly matte finish that comes from using TLS as a coating. There is some cloudiness, but it is perfectly clear when sponged on and then baked. Translucent Liquid Sculpey also makes a really good bakeable glue and is good for moistening crumbly clay. It is an excellent all-purpose liquid clay, but isn’t a shiny clearcoat. It’s an excellent matte surface effect. TLS has a dry, hard feeling after baking that is similar to the surface of any polymer clay. Contrary what is seen in an often-shared YouTube video, I have never (never!!) been able to make thick coatings of TLS become clear by using a heat gun. Formerly known as Fimo Deco Gel (Deko Gel in European packaging), Fimo Liquid is a cloudy-appearing liquid with a distinct odor that I can’t describe but can easily recognize. It has obvious granules in it that appear to be suspended in a runny honey-like liquid. Fimo Liquid can bake quite clearly when poured into a bezel, but if it’s too thick, it will have lots of bubbles and plaques. After baking, the surface of Fimo Liquid has a slightly rubbery feeling to it. The surface also doesn’t bake shiny, rather it bakes up to be a semi-gloss or satin. Because of this, you will need to coat the surface with a glossy varnish after baking in order to get a glossy finish. Like all other liquid clays, Fimo Liquid works nicely as a bakeable glue and to soften crumbly polymer clay. I like using Fimo Liquid as an all-purpose liquid clay, and it’s stellar as a colored glaze in faux ceramic effects, but it’s not my favorite for creating clearcoats. I know that some people have had very good flawless results with Fimo Liquid, but for me it forms lots of bubbles, plaques, and the surface can have a fine, pebbly grain at times. Years ago, when Kato Polyclay first came out, Kato Liquid Polyclay was known as “Kato Sauce”. It’s a white, runny liquid that’s very similar in appearance to white glue. After baking, it becomes a milky clear color. There is no noticeable graininess to Kato Liquid. The odor is the same as the distinctive “vinyl baby doll” smell that blocks of Kato have, but perhaps not as strong. After baking, Kato Liquid has a rubbery, vinyl feeling and makes excellent window clings. Kato Liquid is unique in that it can be made to be completely clear when you use a heat gun on it. You can do this after baking, or you can just use the heat gun to cure the Kato Liquid. If you do this with several thin-ish coats, you can get a remarkably clear surface treatment. Doing this will make the surface extremely glossy and glass-like. The surface will also be hard, eliminating the rubbery feeling and making the surface able to be sanded without balling up and peeling. Of course Kato Liquid does all the normal liquid polymer clay things, too, so it’s really quite a good bottle to have on hand. Kato Liquid Polyclay gives a glass-like shine after baking, especially when cured further with a heat gun. Brand new on the market in May 2017, the newest of their liquid polymer clays is Sculpey Clear. It is very much unlike the other three liquid polymer clays in this article, and I think we have a wonderful new addition to the lineup! Sculpey Clear is also a runny white syrup, similar to white glue when unbaked. It doesn’t have any graininess. It does not seem to form bubbles during the curing process and bakes remarkably clear, yet with a slight cloudiness. Compared one-on-one, it does not get quite as clear as Kato Liquid, but it’s awfully close. After baking, it has a slightly rubbery feeling that doesn’t go away when a heat gun is used. Sculpey Clear is perfect for filling bezels (if they’re not too thick) and is a good, bakeable alternative to resin. The surface of Sculpey Clear is semi-glossy after baking. It is not glossy and would need a coat of Varathane to become glossy. You can make Sculpey Clear more translucent after baking when you use a heat gun, but it does not clarify in the dramatic way that Kato Liquid Polyclay does. One odd drawback to Sculpey Clear is an unfortunate tendency to cure with small pits in the surface. They’re not huge, but it can mean you need to give it another thin coating and bake once again. A common use for liquid polymer clay is to fill bezels to create a coating over some decorative element, such as (in this case) a really neat cane slice. For thick, domed coatings or for covering complex textured items, you’ll have better luck with a resin. But for simply filling a thin bezel or levelling an uneven area, liquid clay works well. TLS isn’t very clear when doing this, so I’d choose one of the others. As you can see in the photo below, the clearest results come from Kato Liquid Polyclay, but the next best is Sculpey Clear. Both gave clear, bubble-free coatings. Clockwise from upper left is TLS, Fimo Liquid, Sculpey Clear, and finally Kato Liquid Polyclay in the lower left. All were baked at 300°F (150°C) and then further clarified with a heat gun. Note the slight cloudiness of all but the Kato Liquid. This effect can be reduced greatly by coating the surface with Varathane, as you can see in the photo below. (Top to Bottom) Here’s Fimo Liquid, Sculpey Clear, and TLS that have been half-coated with Varathane to show that adding a varnish to the top of the cured liquid clay surface will enhance the clear and transparent result. As I mentioned several times in this article, you can use liquid polymer clay as a clearcoat or sealer, especially when cured with a heat gun. This is best on items that are not heavily textured. For specific instructions on how to do this with Kato Liquid (the other clays are similar), go visit Debbie Crothers to buy her video on this very subject. She shows you exactly the way it’s done. No more varnishes, sealers, glazes or other sticky coatings. Liquid polymer clay is the perfect way to coat clay to have a protective surface. Here is an assortment of beads using the various liquid clays. The base bead is just black Premo, baked, and the liquid clay was brushed on and then cured with a heat gun. Notice the varying gloss levels with the different liquid clays. From left to right we have Fimo Liquid, TLS, Kato Liquid Polyclay, and the last two beads are Sculpey Clear. I would love to recommend a liquid clay finish for all circumstances, but I have to say that I can’t. In all cases, the surface has specks, bubbles, and small irregularities. No matter how well you let it settle, use a dust-free environment, remove specks, etc, there always seems to be little bubbles and flaws in the surface. This just seems to be the nature of the beast. That doesn’t mean you shouldn’t use this technique, because it’s just so darned useful! But do be aware that it’s not going to be as smooth as sanding and buffing. I just wanted to give you a heads up so that you don’t beat yourself up wondering where you went wrong if you get specks. Okay? Okay! Now go get some liquid clay and a heat gun and have fun! Many thanks to Iris Weiss and Polyform for giving me a sneak peek at the new Sculpey Clear. The TLS and Liquid Kato were provided by Linda Prais of Linda’s Art Spot. She carries all these liquid clays (plus other incredible stuff)! To create the black bezels, I used CaBezels provided by Wendy of Shades of Clay. The lovely ornate cane slice used at the bottom of the bezels is by the incredibly talented Ivy Niles of iKandiClay. Another incredibly useful article, thank you SOOO much! That was a great review Ginger. Fortunately I had ordered several bottles of Kato clear liquid clay a while back so am well stocked. Have not seen the new clear Sculpey yet but do plan to try it when available. Thanks so much for all your testing. Hey, Ginge: I’ve never used TLS, but when I stopped using Kato products, I went to Fimo Deko Gel. (I’m still using it, with the “Deko” name, and it’s not grainy. When I’m finally unable to get the Deko stuff off Amazon, I hope I don’t get a new and grainy formulation?) I wanted to ask: the Kato gel was a LOT better to buff up. (I sand and use a buffing wheel, but if I luck out, I can use just the buffing wheel to make things shiny.) In going to the Deko Gel, I discovered if can’t be buffed. Makes it all rough and ugly, as if it’s sloughing off. That was a huge disappointment, as the Kato Gel usta buff up like glass, and I’d often use it even if there was no reason to for that purpose. Now if I’m forced to use a coating to protect something (leaf, powder, etc), I’m stuck either using Deko Gel or my beloved (air dry) Ranger Glossy Accents. Do me a favor and try sanding (or buffing, if you have a wheel) the Sculpey Clear and tell us the results? If it buffs up beautifully like the Kato, then I might switch to it when it comes out. (Son of a gun! When grabbing the bottle of Glossy Accents so I could get the name right, I noticed my new bottle of Fimo doesn’t have “Deko” in the nameafter all. Whee! I haven’t noticed a difference in the formula. Whew! Dodged that bullet!) (Maybe my next bottle. ) (Amazon is still advertising the Deko gel; I just keep repeating my order.) Would love to hear how it buffs out! Thanks for giving us something to look forward to, and for t sting it throughly so we know what we’re gonna be spending our money on soon! I’ve not tried buffing any of the liquid clays. I would think that the Sculpey Clear would have the same problem as buffing the Fimo Liquid. It’s rubbery by feel. I’d use Kato Polyclay if I needed a super high glassy shine, and have fun with a heat gun. It’s far superior in appearance and no work at all. thanks for the tests !!! Thank you for your work for us! Ha Ginger – you have been reading my mind yet again! Thank you for this excellent article. I just wish I’d seen it on Friday and saved me the experiments over the weekend. I have also been lucky to have a sample of the new Clear Sculpey to play with. I’ll go back and have another more informed play. As a note of interest, a very very very thin sheet (as thin as you can go) of Premo frost clay over metal leaf effects (with alcohol inks etc) cured as usual, then carefully zapped with the heat gun gives a lovely glossy finish. This can be buffed on a wheel to a high shine. Yup, a thin sheet of trans can be really effective. It is hard to keep from getting bubbles under it, though. Thanks for yet another brilliant article. Have yet to try TLS. ..my normal ‘go-to’s’ are Fimo and Kato for different reasons. Can’t wait to give the new Sculpey a try…..well once it gets as far as the UK!!!! Thanks for the great info Ginger! Loved seeing the new Sculpey Clear in action too! Whee! Wow – new Sculpey Clear – will be glad to play with that one. Thanks so much for investigating the different liquid clays! Another easy to read and understand article, from the scientifically crafty minded Ginger. Brilliant job, thanks. I’Il look forward to trying the new brand when it becomes available. Great article and very timely for me; I was just looking for an alternative to Pym II for coating painted objects. One question – can these be thinned down with water to provide a thinner coating or to save older liquid that has got too thick? Thank you for all the hard and boring (to me) testing that you do on clayers behalf. No, don’t use water! But you can thin it with Sculpey Clay Softener. Or possibly a tiny touch of baby oil. Liquid clay cleans up with alcohol, btw. Looking forward to adding the 4th liquid clay to my tool box. Love your article…quick question…Which lp would you use for dew drops on flowers? I would use Fimo Liquid, I think, but do bake it ASAP as it will flatten and run fairly quickly. Imagine making drops from honey…it flows. Thank you for another great review! It was very enlightening to see the liquid clays cured in glass vials. I’ve also found liquid clay to be the best sealer, as far as not scratching off, though I’m only starting to use resin, which is pretty impressive. It seems the bubbles that appear when liquid clay is baked over raw clay are air or gases escaping from the raw clay. I haven’t noticed Fimo liquid being gritty, (not like TLS anyway) but it is rubbery and can come off when buffed, so I add a coat of Fimo Gloss Varnish over it if I want it shiny. I had a hard time getting Kato liquid to stick to Soufflé, whereas Fimo liquid and TLS stuck just fine. I’d be interested to know how the new Sculpey Clear sticks to different brands of clay. If it’s like TLS, it should be just fine. It should be a great addition because it probably cures at 265˚, so it can be baked on clays that need lower temperatures and then blasted with a heat gun to make it clearer and shinier. I’m looking forward to trying it. I’ll leave further testing in your capable, hands. 🙂 I didn’t do any buffing…I’d use a different process if I wanted a high gloss…namely I’d use Kato Liquid. Sculpey Clear should be baked at 300°F, and honestly I never have trouble baking Sculpey products at that temp anyway. It’s only Fimo products, and lighter ones at that, that I have trouble with baking at 300°F. But I’m a rebel like that. 🙂 And all the more reason to have various clay brands on hand for use in different situations. No one brand can be all things to all people. You are a rebel! I just got my bottle yesterday, baked some at 300˚ in a Sculpey mold and it’s full of little cracks. Arrgh. I popped it out of the mold while it was fairly hot and probably flexed it. Thanks for this greatly needed article. Just came at the right time! Just one question. How do you apply the Kato liquid on the piece to get a thin even layer? using a brush? You can use a brush, which is nice if you are applying it to something round like a bead. Or just spread with your finger. It is self-leveling. Give it a few minutes for any bubbles to rise and pop, and also level out a bit. Thanks for the quick reply. o… can I ask another one? I just bought a commercial 2000W air heater gun, so I wanted to know how much time should I blow on the Kato liquid ? It’s going to depend completely on the size of the piece, the speed of the air, how closely you hold the gun to the piece, and how much moving around you do. It’s not a time-based thing like popping into the oven. You’re essentially “painting” the clay clear with the heat gun and there’s a lot of judgement involved. Get your good glasses, a strong light, and be prepared to ruin a few before you get the hang of it. With my gun, a 5/8″ bead was cleared in about a minutes, maybe a touch less. But those filled bezels were more like 2-3 minutes, or even longer. I really didn’t check on the time. But maybe that will give you an approximate idea. I really do urge you get Debbie Crothers’s video tutorial if you have any questions. She’ll get you set up, and seeing the process on video is highly illuminating. I use Kato liquid with deep bezels(metal or preformed polymer clay), and silicone molds that are bake-able and have had no problem. I do use a different process then you. I find thin coats(clear or colored) that are baked or heated gunned work very well. I build layers and then use slices of canes or additives and then proceed with more thin coats. I also find Kato works well on agates or stones that are set then need to be sealed to protect them from fractures instead of the traditional glues or epoxies. I once again use a heat gun and apply thin coats. I have had great success treating the Kato liquid the same as I would for agates/semi precious stones final buffing resulting in a glass like finish that looks wet. Leather is one of the best final buffing materials. I do not know if this will work for everyone as I learned to buff based on my lapidary/metalworking and have found I do have different techniques because of how I was trained. As a side note what you use to coat your piece makes a difference I.E. type of brush(natural or synthetic) or dipping. Thank you for all your great articles and testing I find myself referring friends to your site for reference materials, how to’s and ideas. Happy creating. Thank you for your efforts on our behalf Ginger! Your work is greatly appreciated. Hi, Ginger, Another great article!! I’m looking forward to the Sculpey Clear being available. I also wonder if a drop or two of alcohol ink for special effects – just to color it a bit – would affect the clarity of it. Will have to try it. 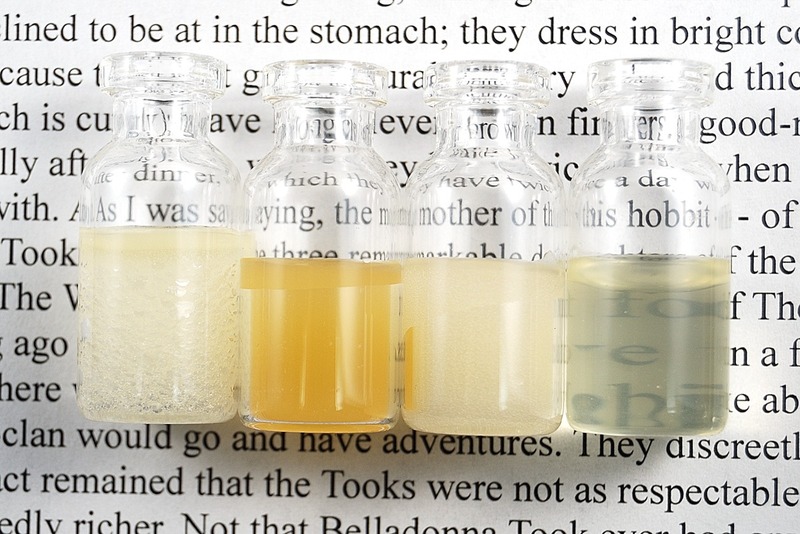 Hey – LOVE that you used Tolkien text to show us those samples! I’ve used sculpted clear do love it. But my favorite is Cernit glossy. I haven’t been disappointed with either . I would like to see what you think of Cernit they have glossy and matte. Just ordered some clear Sculpey (yay! ), so I came back to this article to refresh my memory. I had a couple of questions on the gloss level of the new clear liquid. You mention (and show) that the final cured surface of Sculpey Clear is semi-gloss. But there’s the super shiny black bead that has a liquid clay coat on. Is the difference because one was cured in the oven and the other was cured with a heat gun? Or thinner vs thicker layers? I don’t plan to use it to replace resin, but I would like to use it instead of a sealer where possible. In the picture, you can’t really tell the difference, but it’s a lot more clear in person. A thin coating of any of the liquid clays will make a fine sealer, but I particularly like the way that liquid Kato gets harder and less rubbery when it’s treated with the heat gun. Liquid Sculpey Clear will work just fine, too, but won’t get the super shiny glossy effect…more of a semi-gloss. Of course that is often exactly what’s needed. The Sculpey Clear doesn’t get more glossy with the heat gun…or at least it didn’t for me. I played around with the new stuff and realized what you mean. I think it’s glossy, not shiny. Kato is ridiculousy shiny, looks practically wet. But I was able to cure this stuff with my embossing heat gun and I didn’t burn anything! I might switch to Sculpey liquid just for that. Terrific article; I have been experimenting with Sculpey Clear and Kato and, as you mentioned, I keep getting tiny bubbles/flaws. So thanks for mentioning that – thought it was me. I have to say though, when watching a few videos of this technique I didn’t see those flaws appear in the pieces in the video. hmmmm???? Oh well; I’ll try a second coat and see what happens. Thanks you for all the work you do! Yes, Kato is runnier. But the others have other purposes besides a glossy coating. TLS is fantastic as a matte coating. Sculpey Clear can be cured thickly and used in molds. Each has a different behavior and sometimes your project will require one vs the other. I have a stone wear air dry clay that I want to seal with something food safe. Would Sculpey Clear work? No, all liquid clays are vinyl and are not certified to be used to coat items that will contact food. I’m one of “those” crafters who dabble in several different crafts, so I’m always on the look-out for tools that can work across platforms instead of buying multiple tools that basically perform the same function. My question relates to the use of a heat gun. I have a micro butane torch – the Dremel Versaflame, which includes a flame deflector and a flame diffuser; its heat is also adjustable. I would guess that you probably have not tried a micro butane torch, but with your best guess, do you think that this would work for heating the liquid clay? Thanks for any insight you can provide! You are absolutely the go-to for definitive answers. I’m in awe of how much testing you do and freely pass on to all of us! I don’t have a butane torch to check, but my gut feeling is that it would not work. I fear that it would burn on the surface without allowing the heat to penetrate deeply enough to cure the liquid clay further down. This is already an issue with a heat gun, and I think a flame would be even worse. But I never say never and it’s certainly worth trying if you have the torch already. Your site is a real Godsend to many of us because of the time and effort you spend testing products and techniques to the point of success, then spending more time converting your process into a coherent, reasoned reference for us here. hank you! I recently picked up a bottle of Sculpey Clear thanks to this great review. One question, though: would it be possible to dye the clear Sculpey using alcohol inks? Thanks for another helpful article! I’ve been working with polymer clay for 4 years now and I still haven’t touched liquid clay. I just wanted to know the difference between bake and bond and TLS? Is there a huge difference between them or can substitute them for each other? Bake and Bond is a thicker version of liquid clay that is used as a bakeable glue. It is not translucent. You can use liquid clay as a glue, but because it’s thinner, the pieces will slip around easily. You can’t use Bake and Bond as you would use liquid clay because it’s not translucent. Hi, how would I use sculpy liquid clear over fimo soft or proffesional with creating a fire hazard? The sculpy clear baking temperature is higher then the fimo? There is no fire hazard. Sculpey Liquid needs high heat to fully clarify, and that is best accomplished by using a heat gun on the finished piece. Doing this, you are able to control the heat. Baking at 300+ is necessary when you are using Sculpey Clear by itself, such as when you are using it in a mold. Hi Ginger. My daughter made a doll turkey approximately three inches long and about one and a half inch thick( aluminum foil is used inside the turkey as a filler). We baked the turkey and it came out great, however, I thought it needed a little gloss. We have Liquid Sculpey Clay. When I put it on the turkey, do I need to retake it? All liquid clay needs to be baked to cure. BTW, make sure you’re using the right liquid clay. Sculpey Clear will be clear. Sculpey Translucent will be cloudy. Would anyone have any recommendations as to which Liquid clay would work best in a silicone mold? I am wanting to make very thin clay “filigree” that I can bake, peel out of the mold, and use with other projects. Am wondering which brand would be the “sturdiest” for this application. I would use any of the Sculpey bakeable mediums, but add a tad bit of Sculpey Clay Softener to it for a very flexible and strong result.